I am inspired by Christopher Boffoli because of his whimsy. They ARE food photographs but not in the way that we usually think of food photography. 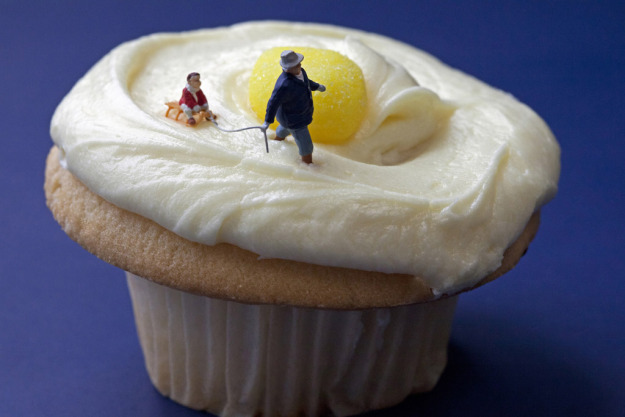 Boffoli creates miniature figures who interact in creative and sometimes ridiculous ways with food. "The genesis of my Big Appetites series of fine art photographs was in a lot of the media I was exposed to as a child. There were so many films and television shows that exploited both the dramatic and comedy potential of a juxtaposition of different scales: tiny people in a normal-sized world. It is a surprisingly common cultural theme going back all the way to Jonathan Swift's Gulliver's Travels in the 18th century and perhaps earlier." It's an art to use a whimsical theme and not let it get ridiculous or tired. Or be so bound by it, if it becomes successful, that you cannot move onto something else. I won't name names but there are photographers who use animals anthropomorphically that started out fresh and new but end up stale and tired. Easy for me to say of course as an amateur! I can't really tell you why I love these but I do. And I'd love to try and recreate a few to learn from them - both the technical aspects of these shots (lighting, composition, etc) and how to lay out the scene with the miniature figures. Boffoli has a show at the Winston Wachter Fine Art Gallery in NYC from June 21 - August 24, 2012. ALT-NYC attendees, let's go see it!